World Boxing Council President Mauricio Sulaiman expects to eventually bury the hatchet with Mexican superstar Saul "Canelo" Alvarez (49-1-1, 34 KOs). Canelo will challenge WBC, WBA, IBF, IBO middleweight champion Gennady "GGG" Golovkin (37-0, 33 KOs) on September 16th in an HBO Pay-Per-View main event from the T-Mobile Arena in Las Vegas. The Mexican two division world champion has made it very clear that he's not even considering the possibility of fighting for the WBC title next month. The conflict began over a year ago, when Canelo said the WBC was pressuring him to make a mandatory defense of the WBC middleweight belt against Golovkin. Canelo was dealing with a legal issue in Florida, and said the WBC gave him no time to reach a deal by scheduling a purse bid and refusing to postpone the date. A few days before the purse bid was going to happen, Canelo vacated the title and the sanctioning body elevated Golovkin to the status of full-champion. Making Golovkin the champion, without fighting for the belt, only infuriated Canelo further. Back in May, Canelo rejected the WBC's request to offer up a commemorative title for the showdown with Julio Cesar Chavez Jr. Canelo claims that despite his rejection, the WBC still created the title and used his fight for publicity purposes. 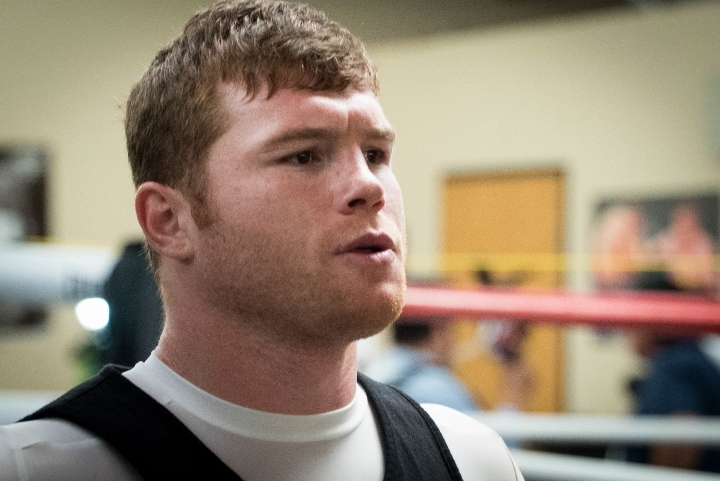 "There has been no contact [from Canelo]. He must be involved in something that is important and that is training for this fight, the same fight that created this conflict between us. The Council has nothing against Canelo but pure attentions, goodwill and friendship. I am sure that this misunderstanding will be clarified in due course. Our current middleweight champion is Gennady 'GGG' Golovkin and he will proudly defend the WBC green and gold belt on September 16 at the T-Mobile Arena against Saul Alvarez," concluded Sulaiman. wbc guy still hopes Canelo is gonna accept that Huichol belt and be a sanctioning fee member. LOL ! Canelo ain't that stupid to give from his hard earned money to some abc org. The WBC almost put this kid in the poor house... Shame on them!!! He doesn't want your watered down titles, which ironically he helped water down. Just move on. Top Headlines Yamaguchi Falcao-Chris Pearson Landed on Facebook Watch Kash Ali Suspended For Six Months, Fined 10K For Biting Price Khan: The Fight Was 100% Turning, Crawford Was Slowing Down Regis Prograis Helping Youth As Big WBSS Fight Nears Apti Davtaev, Umar Salamov Ready For More After KO Wins Danny Garcia: I Hope I Didn't Scare Manny Pacquiao Away Commey Eyes June Return, Future Unifications - On His Terms Arum: Danny Garcia Is Not A Real Fight For Terence Crawford Terence Crawford-Amir Khan: Afterthoughts BoxingScene Championship Stats, Records: April 2019 Update Hatton: Kid Galahad To Provide Very Tough Test For Warrington McGuigan Comes To Khan's Defense in Wake of Quitter Claims Khan: I'll Always Have World Title Fights, Brook Will Be There Too Jeremiah Nakathila Wins Big, Targets Masayuki Ito Title Shot Fabio Turchi Will Now Face Sami Enbom in Florence, Italy Doheny's Dream Run Continues With Unification Against Roman Ellerbe: Arum Lost His Mind, He Talks Sh*t and Then Wants a Deal PBC Exec: Arum Desperate, Great Fights Ahead Like Crawford-Khan Khan: I Have A lot Left, This Won't Be My Last Fight, I'll Fight Again Photos: Andy Ruiz Makes PBC Debut, Batters Dimitrenko Granados: I Think The Referee Was a Little Over-Protective Tete Warns Donaire: Whoever is in My Way - I'll Take Him Out Kell Brook: I Want Terence Crawford Next, Khan Fight is Dead Photos: Shakur Stevenson Dominates Christopher Diaz Hearn Enraged: Jarrell Miller Swore To Me on Kids' Lives - F*** Off! Arum: Haymon Will Tell Spence 'Don't Listen To The White Guys' Andy Ruiz To Adam Kownacki: I Want To Fight, Let's Do This! Photos: Danny Garcia Wipes Out Adrian Granados in Seven Teofimo Lopez Feels Ready: I Want a World Title Shot Next Photos: Teofimo Lopez Cracks Edits Tatli With Body Shot Danny Garcia: When I'm at My Best - Nobody Can Beat Me! Crawford: Whenever Spence is Ready - He Can Come & Get It! Photos: Crawford Drops Khan, Strange TKO End After Low Blow Photos: Dave Allen Blasts Out Lucas Browne With Big Body Shot Photos: Chisora Fails To Impress in Decision Over Gashi Archie Sharp Feels Ready For a Showdown With Lee Selby Teddy Atlas on Crawford-Khan: It's Not Good For Boxing or ESPN Kell Brook: Amir Khan Quit, He Was Looking For a Way Out! Arum: Khan Was Looking For a Place To Fall, Could've Recovered! Crawford To Amir Khan: You Didn't Quit? Tell The Truth!